Babies often develop diaper rash because their skin is trapped in a warm, moist environment for long periods. Diaper rash can also be caused by allergies to diapers, soaps, detergents, or other skin care products, and the symptoms typically include skin inflammation, redness, and itching. There are plenty of diaper rash creams on the market, but they can be expensive, and you never know how safe they really are for your baby. Instead, try the home remedies outlined here. These remedies are simple, safe, and effective, and they use only basic, familiar ingredients you can trust. Let’s get started. Baking soda neutralizes the acids that cause diaper rash. It also keeps skin dry and germ free to prevent infection. Add 2 teaspoons of baking soda to warm bath water. Give sitz bath to baby for 10 minutes. Bathe your baby three times a day to prevent diaper rash. Maalox soothes skin by neutralizing the acids that cause diaper rash. Use a cotton ball to apply Maalox directly to your baby’s skin before putting on a fresh diaper. Let it dry and then dress the baby in loose clothes. Urine is very alkaline and can burn the skin with prolonged exposure. Vinegar balances the skin’s acid-alkaline ratio to prevent and help treat diaper rash. If you use cloth diapers, add ½ cup of vinegar to the wash when you clean them. If you use disposable then mix 1 part of vinegar with 8 parts of water and apply to baby skin when you change diapers. 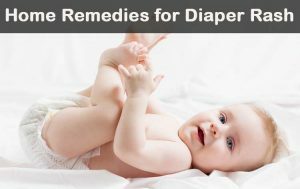 Repeat regularly to prevent and treat diaper rash. Coconut oil protects against yeast, fungus, and bacteria, and it soothes and softens the skin. Whenever you change your baby’s diaper clean baby bottom with warm water and let it dry for few minute. Apply coconut oil to the skin. Oatmeal soaks excess moisture off the skin while soothing and softening. Add 2 teaspoons of dry oatmeal to your baby’s warm bath. Soak the baby for 5-7 minutes. Dress the baby in loose diaper and clothes. You can also apply cream suggested by doctor. Urine can throw off the pH balance of your baby’s skin. This causes irritation and results in diaper rash. Cranberry juice prevents bacteria from sticking to the inside of the bladder, so it won’t end up on your baby’s skin and cause infection. Give 2-3 ounces of cranberry juice to older infants once a day. Olive oil creates a barrier between skin and the bacteria in feces and urine. Mix 1 teaspoon of olive oil with 2 teaspoons water. Wisk until you get a creamy texture. Apply directly to skin and allow it to dry completely. Optional: mix lavender oil or vitamin E oil into the olive oil and water solution. Plantain oil has anti-allergy properties that will prevent against diaper rash caused by allergic to diapers and skin care products. It also soothes the skin and reduces inflammation. Apply it directly to your baby’s skin after changing and cleaning her. Let it dry then dress her in loose clothing. Petroleum Jelly prevents diaper rash by acting as a barrier between urine and feces and your baby’s skin. Clean the baby bottom and allow it to dry completely. Mix petroleum jelly with vitamin E oil and apply it to your baby’s skin. Wear loose clothe once it dry. Breast milk contains natural anti-bodies that protect your baby from bacteria. Apply some to the skin after changing and washing your baby. Grapefruit seed extract is a very effective cleanser. It leaves skin free of the germs and bacteria that cause diaper rash. Always dilute it before applying to your baby’s skin. Mix 5 drops of grapefruit seed extract and 4 ounces of water. Use it to rinse your baby whenever you change diaper. Change your baby’s diapers frequently to prevent prolonged contact between skin, feces, and urine. Avoid commercial baby wipes that contain alcohol and other harsh chemicals that irritate skin. Instead, use a mild soap to clean your baby. Whenever possible keep baby without diaper. Make sure your baby’s skin is completely dry before putting on a fresh diaper. Wash your baby’s clothes separately from everyone else’s, and use mild detergents. Dress you baby in loose, breathable clothing so moisture won’t build up and cause friction. If rash is persistent, try using a different brand of diaper, detergent, soap, etc. Wash your hands after changing your baby’s diaper to prevent the spread of bacteria. If the rash does not subside after 1 week, consult a pediatrician. Have you tried any of these home remedies for diaper rash? Which ones worked best for you? Share your experience with us! My 6 1/2 month old has her first diaper rash, I think from me drinking too much vitamin C (emergenC ) coming through her breast milk. I put cold breast milk compressions (fridged expressed milk & flat cotton rounds, cut them in half) left in diaper & made new ones for each diaper change. Noticing a significant Improvement over the course of one day.